The Veteran Affairs Department plans to enter what is likely to be a multibillion-dollar competition to supply an electronic health-record system to the Defense Department's Military Health System. Even if the VA fails to win the job, the two departments' EHRs will be so closely aligned that interoperability between them will be greatly improved, Gen. Eric Shinseki, the VA secretary, told members of Congress last week. Shinseki's pledge came at a House Veterans Affairs Committee hearing on the VA's $163.9 billion annual budget request. The VA has asked for $893 million for three key health IT projects. In late January, the Defense Department issued a draft request for proposals for a modernized EHR that also would be interoperable with the VA's VistA system. The department planned to issue up to two more RFPs on the project, which could see a rollout of its first system in the Pacific Northwest sometime in 2016. Shinseki was questioned by committee member and physician Rep. Phil Roe (R-Tenn.) about a timetable for achieving long-sought interoperability between the EHRs of the VA and Defense. Shinseki said he and former Defense Secretary Robert Gates had been seeking to develop a single, jointly developed EHR, but Gates' successor, Chuck Hagel, last year decided it would be more cost-effective for the Military Health System to procure an EHR rather than develop one internally. “As he pursues his requirements for his acquisition, we are monitoring and having discussions, and if there is a capability there that he is looking for that we don't have, we're going to go after that and make sure that we include that. When we get to the point where he is ready to make a decision on the DoD electronic health record, we want to be in the competition,” Shinseki said. The VA has put the basic software code for VistA into the public domain and “other contractors have picked up on it and have begun to incorporate that into their solutions. 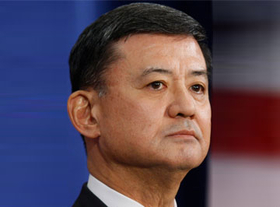 I think that makes it healthy,” Shinseki said. “We think we're going to be competitive, but, however it comes out, we're going to be very, very close at the end. Even if it's not a single, joint, common electronic health record, the interoperability is going to be much greater than it is today,” he said about the VA and Defense Department. The Defense Department's Military Health System runs 59 hospitals and about 360 clinics while the VA's Veterans Health Administration operates 151 hospitals and 827 clinics. Former VA Chief Information Officer Roger Baker estimated the VA would spend $16 billion if it tried to replace VistA with an off-the-shelf EHR. By that measure, a commercial EHR for the Defense Department might cost more than $6 billion.